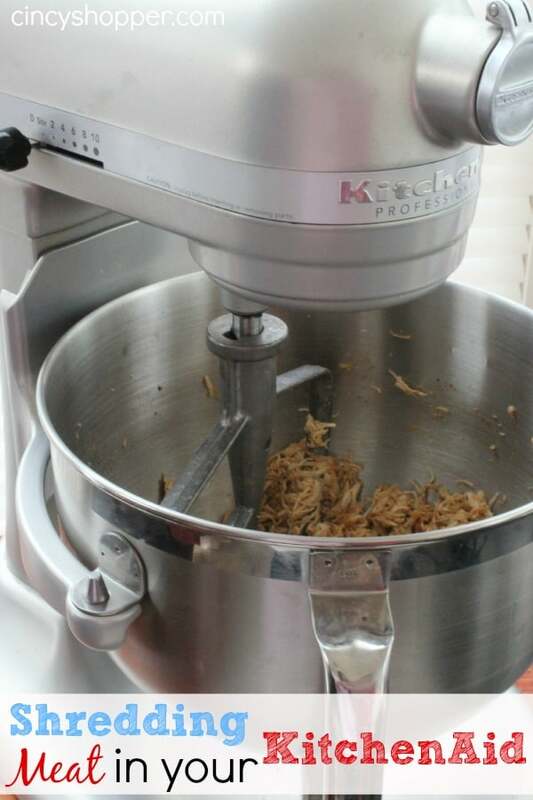 Are you curious how to shred meat in your KitchenAid Stand Mixer? I have always spent way too much time shredding meat. 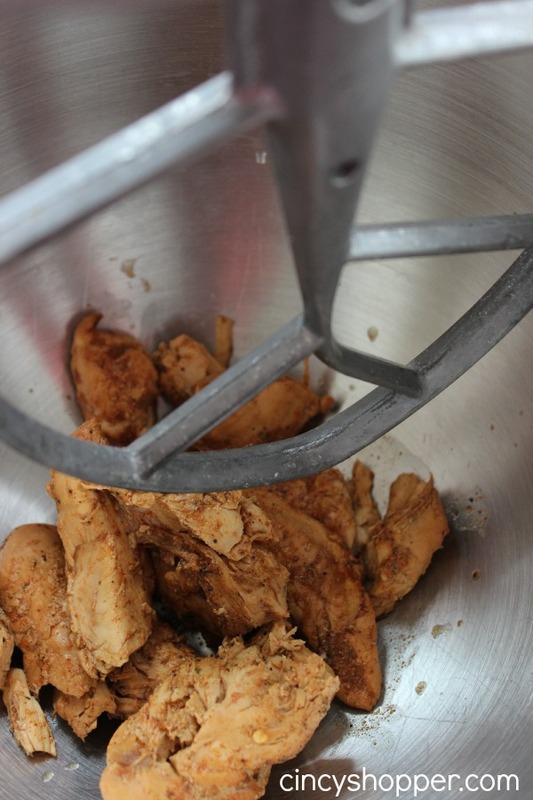 When I learned that you can shred your meat in a Kitchen Aid stand mixer I was so excited. If I could have back all of that time, ha ha. 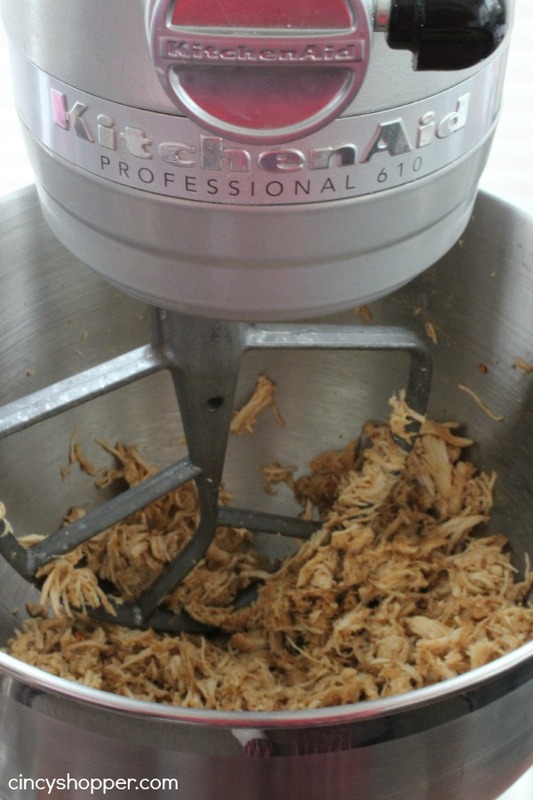 It’s so fast and simple to shred your meat in your KitchenAid. This works great for chicken, beef, pork. I have tried all three. Now that I know this little hidden secret i will NEVER shred meat by hand again. Wow, I can even have the kiddos shred the meat now and they will not complain, ha ha. When using the Kitchen Aid to shred your meat, it is done quick and perfect. I used the Kitchen Aid to shred my meat in my Slow Cooker Chicken Tacos that I shared with you earlier today. With the Kitchenaid and the normal beater attachment, I shredded a pound of cooked chicken breast straight from the slow cooker in under 30 seconds. 4. Enjoy you shredded meat. So you no longer need to hesitate to make recipes like chicken enchiladas, pulled pork, or beef barbecue because of this tedious job again. If you don’t have a Kitchenaid, here is just another great reason why you might just want to use it for other things besides baking. Hi Jen! I didn’t know the Kitchenaid can do that but I would definitely try this one. Thanks for the recipe! Please check out my site http://spillovercoffee.com. Such a great tip! Do you find it makes a difference how much sauce is already on the meat? If I cook my pork in BBQ sauce in a slow cooker and then want to shred it in the mixer, will it just slide around? I don’t think it would make a difference. I would probably lift the pork out of the slow cooker first and shred it and then pour the sauce in to mix it. I make buffalo chicken dip that way. First shred chicken then put in the other ingredients. Great post, very helpful! I will never use forks to shred meat again the stand mixer is just too easy to use. The only catch being make sure your meat is still hot. Today I was making chicken noodle soup and while tending to my toddler I left the chicken cool too long. The mixer turned the meat into little balls resembling ricotta curds. Learn from my mistakes! Shred it while it’s hot.